Why? 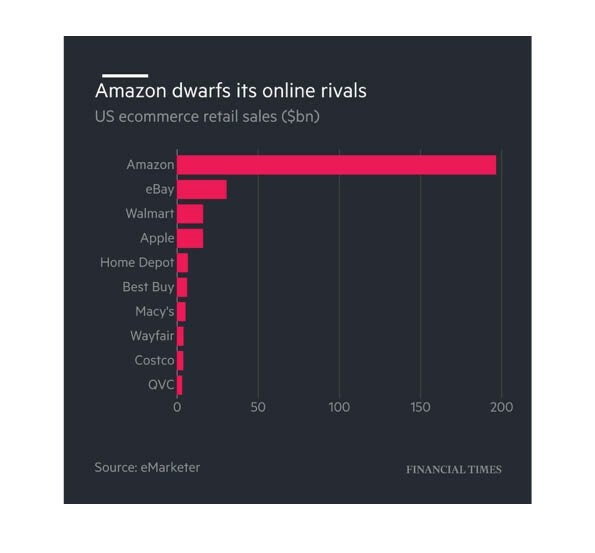 When you look at the graph, you can see at a glance that Amazon dominates the e-commerce industry, and you know that the e-commerce industry is ruining the fortunes of traditional retailers like Sears and Toys ‘R’ Us. But what you may not realize is that much of the Amazon’s $1.6 billion first-quarter profit came from activities other than retail sales. And then there’s Alexa. If you think of Alexa as kind of like Siri on the iPhone, except installed in your house, you aren’t seeing the bigger picture. To see the full Alexa vision, drive to a model home in Irvine, CA, where Amazon conducts tours of the future, coming soon to a home near you. The visitors can use the house’s Alexa voice assistant to turn on the lights, lower the shades, adjust the thermostat and tell them who is at the front door. They can watch television programs and movies from Amazon’s streaming business on its Fire TV device, and listen to music on an Amazon Echo smart speaker. And, of course, they can order virtually anything from the company’s core e-commerce website with the push of an Amazon Dash button.